Daniel and Claire worked for some of the top people in the business before setting out on their own. 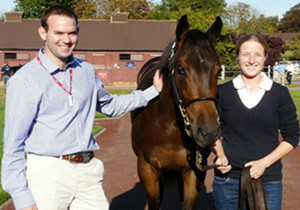 Claire was assistant to leading Californian trainer Paddy Gallagher and classic winning trainer Jeremy Noseda as well as working for leading bloodstock agent John Warren. She grew up on her parents successful stud farm, getting a degree at in natural sciences at Cambridge and qualifying as an accountant with leading firm PriceWaterhouseCoopers before pursuing her dream to train. Daniel worked for a host of successful trainers all over the world including spells as assistant to Derby winning trainer Roger Charlton and Ben Cecil in California. He also has a degree from the Royal Agricultural College that gives him a scientific understanding of the horse as an equine athlete. They are already proving they can take on the big boys, winning maidens at some of the big tracks and training stakes horses from the very limited number of yearlings they have bought.